Deputy Defense Minister blames UNESCO for terror attack, Jewish Home MK says Israel should respond by closing Temple Mount to Muslims. Deputy Defense Minister Rabbi Eli Ben-Dahan responded on Friday morning to the shooting attack at the Old City's Lions Gate in Jerusalem. "The Cave of the Patriarchs (Me'arat Hamachpelah), the Temple Mount, and Shechem (Nablus) are the three places the Bible tells us were bought at full price in Israel," Ben-Dahan said. "These are the three places where no one can question the Jewish nation's ownership." "We see that in the past week Palestinians have made great efforts to undermine the Jewish nation's connection to these places specifically. "It started with UNESCO's decision that the Cave of the Patriarchs is a Palestinian heritage site, and it continued today with the three terrorists who carried out an attack immediately after leaving the Temple Mount. "Israel must fight this effort by strengthening its rule and hold on these areas, and must ensure that every Jew can pray in these places safely and without fear. "I pray for the victims' recovery. The police did well by closing off the Temple Mount, and it should remain closed until we are certain that the area will be quiet and secure." 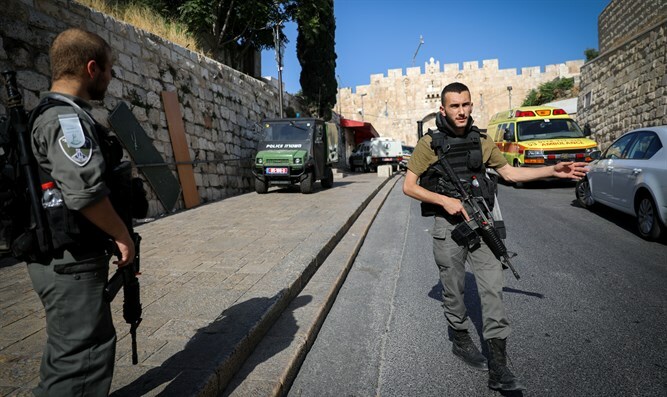 Jerusalem Deputy Mayor Dov Kalmanovich warned that "the shooting attack from the direction of the Temple Mount shows that the terrorists have crossed an additional red line, and it shows that weapons have trickled from 'seam neighborhoods' in Jerusalem's Arab areas." "The current lack of sovereignty in the areas surrounding Jerusalem, the fact that police refrain from entering the Arab neighborhoods, and the weapons confiscations, have all caused this bitter and unfortunate event. "Those who do not deal with shootings in Jerusalem's neighborhood of Pisgat Ze'ev should not be surprised when there are shootings in the Old City and later on in the city's center." MK Moti Yogev (Jewish Home) said, "We see the Temple Mount as a place of prayer - a place which is 'G-d's home, which will be a place of prayer for all the nations.' (Isaiah 56:7) They see it as a base for terror and hatred." "We need to close the Temple Mount to Muslims for an extended period of time, and to tighten our security and diplomatic control of it. "'The Temple Mount is in our hands' should not be a slogan, it needs to be a clear fact on the ground. "We must chase after the terrorists, those who sent them, those who incited them, and those who helped them carry out the attacks." Three terrorists descended from the Temple Mount on Friday morning, armed with two rifles and a pistol. They saw Israeli police officers near Lions Gate, shot at them, and ran back to the Temple Mount. Three officers were injured, two severely and one moderately. The Temple Mount was evacuated and is closed indefinitely.